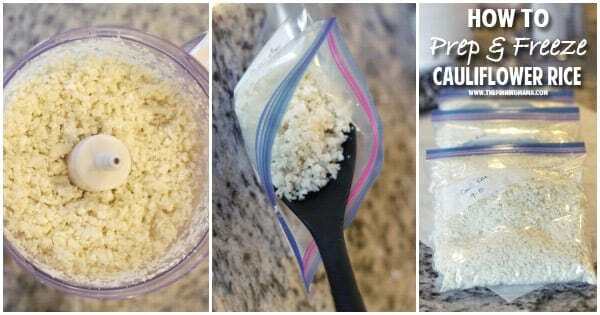 If you are Paleo, doing the Whole30 food challenge, or just eating healthy, learning how to prep and freeze cauliflower rice can save you a lot of time in the kitchen and help you have healthy food on hand when you need it. When we did the Whole30 food challenge this past fall I thought the two hardest parts were not having any grains and having to make everything from scratch all of the time. The grains were so hard because I really missed having the filler in the meal. I never realized it before but we were pretty addicted to the carbs. We almost always have rice or potatoes or some sort of bread with our meal. I had heard of cauliflower rice and after the first few days of Whole30 REALLY needed something to fill up the meal and shake things up a little bit. So I tried it and I liked it! Now to be clear, it didn’t really taste like rice, and the texture wasn’t exactly like rice, BUT it was really good in it’s own right. I served it just like I would rice at any meal and it was a perfect compliment to the meal. In fact, every time we had the cauliflower rice I always felt satisfied and not like I was missing anything. I wanted to share my process to help make healthy eating quick and easy for you too. There are a couple of methods you can use to make cauliflower rice. My good friends at Stay Fit Mom swear by the cauliflower rice blender method. I have a serious infatuation with my food processor though, so I knew that I wanted to use it. Pick your favorite kitchen tool and go for it. First wash your cauliflower. I usually get 2 pound bags of precut cauliflower florets at Costco, but you can also by a head at your local grocery store and roughly chop the florets and stalks and discard the stems and greens. Place about a pound of the cauliflower in the food processor. 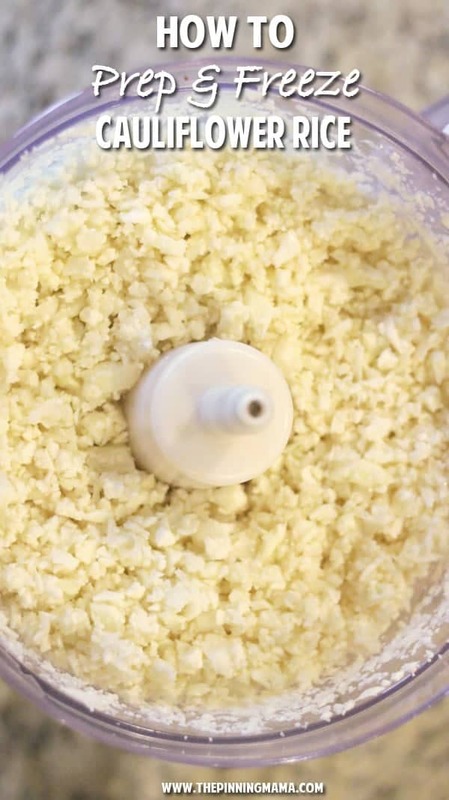 Pulse the food processor until the cauliflower resembles the texture of rice. Be careful to watch the texture not to pulse too much or you can turn the cauliflower into more of a mash and not a rice. Once you have your cauliflower riced, you can get it ready to freeze. First make sure your rice is nice and dry. If you used the food processor it should be good to go. If you used the blender method you will want to make sure to pat it dry and make sure there is not much excess moisture. Next portion it out into separate freezer bags in the quantity that you need for each meal. I usually account for 1/2 cup per person, or 1 cup if it is a main element of the meal like in a burrito bowl or fried rice. I use quart sized freezer bags, scoop the cauliflower in then squeeze the air out and seal. 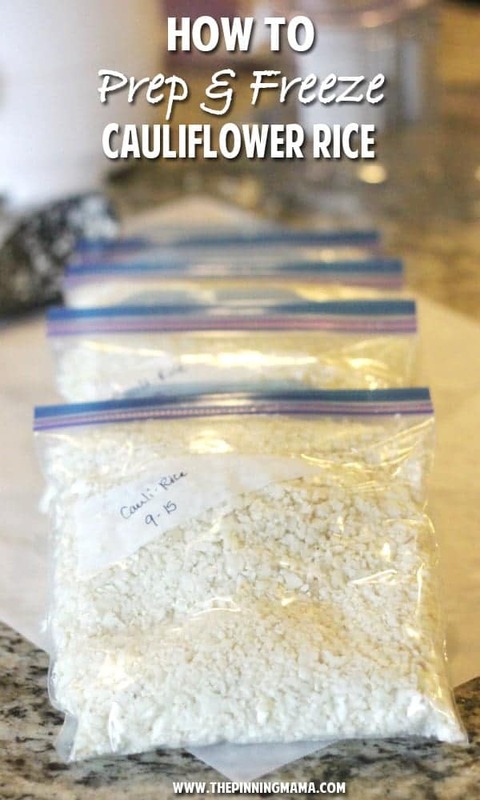 To help store the rice, flatten it out before you put it in the freezer then stack the bags on top of each other to minimize the amount of space you need. Make sure to use a sharpie to label the bags with the date. Standard freezing guidelines say cauliflower can stay frozen for up to 6 months. The whole process ends up to take less than an hour and you can make enough cauliflower for many meals. I like to do about 4 pounds at a time which usually gives me about 8 bags in the freezer to pull out for a family sized easy dinner. To use the cauliflower you can either pop it in the refrigerator the night before and let it thaw over the day, or use the defrost on the microwave. But I usually just put it in the frying pan with the lid on for a few minutes and it thaws right up and is ready to be seasoned and cooked any way you like it! Update: Since writing this post I have received many helpful messages from readers. You can actually buy pre-made cauli rice in the freezer section at many stores. I got the opportunity to sample the cauli rice from Boulder Canyon which was really good, especially when you don’t have time to prep it yourself. Check out some of my FAVORITE ways to cook cauliflower rice! 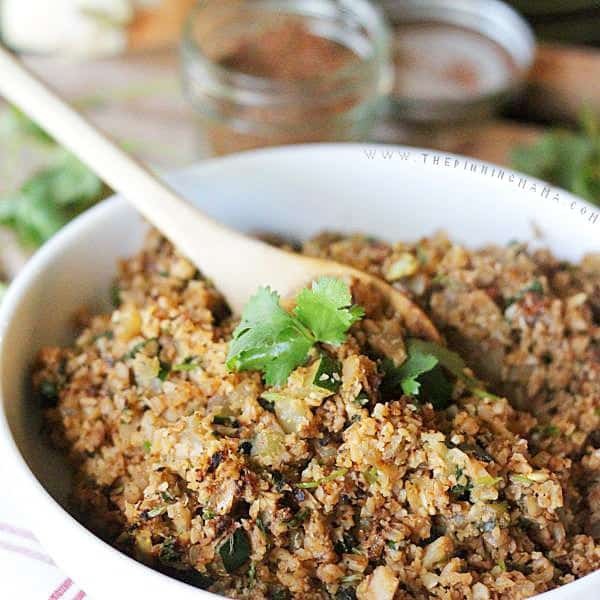 Mexican Cauliflower Rice – We have a SERIOUS addiction to this stuff. I am long off of Whole30 now but we still eat it because it is just that good. Plus, gluten free, dairy free, and low calorie and low carb… you just can’t beat it! 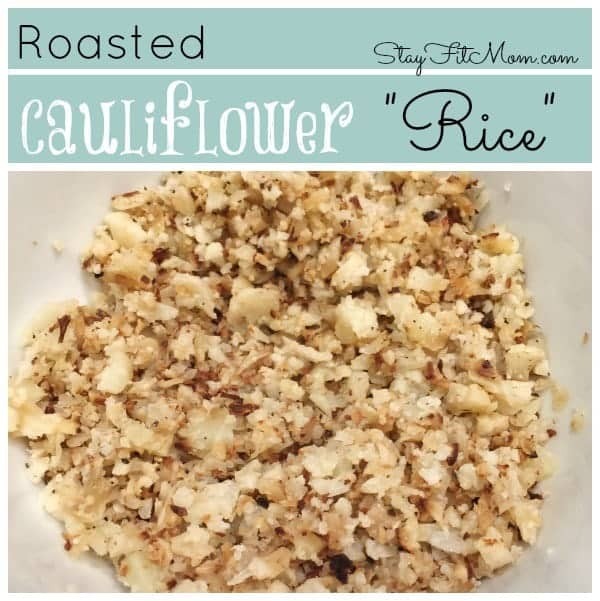 Roasted Cauliflower Rice– My friend Tracy made this recipe for me the first time I ever had cauli rice and it is a classic and a keeper! Perfect to compliment any dish but not overpower it. 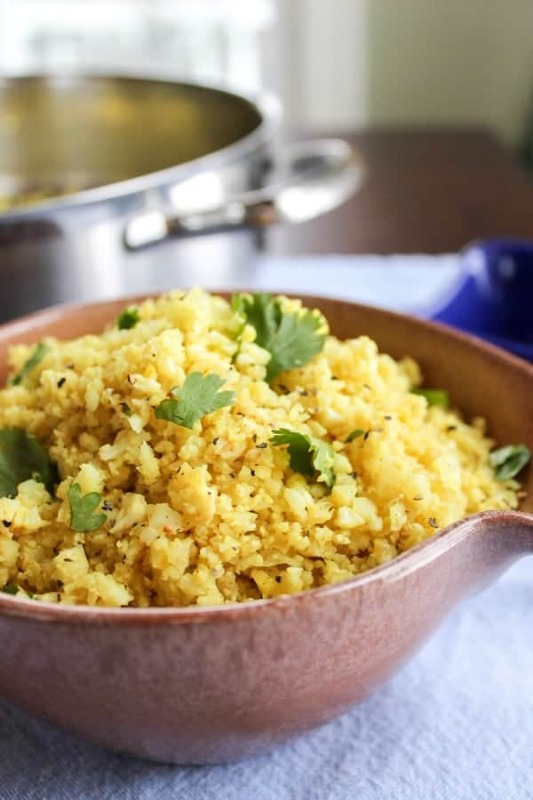 Indian Spiced Cauliflower Rice– Ok I admit that i have not actually tried this recipe yet, but anything my friend Karen makes is DELISH and we have been on an Indian kick lately so this is absolutely next on my list! 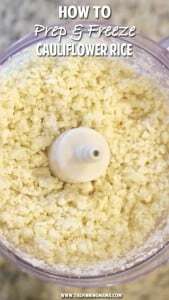 Place one pound of cauliflower into the food processor and pulse until the consistency resembles rice. Be careful not to over process. Scoop about 2 cups of riced cauliflower into each freezer bag. Press air out of bag and seal. Flatten bags and stack to freeze. To thaw place the cauliflower into the refrigerator 24 hours before you want to use it. I love this tutorial! I’ve heard so much about cauliflower rice and I think the concept sounds good, but I had NO IDEA how to actually go about turning the veggie into a rice-like texture! Pinned! Thanks Blair! Kind of crazy how easy it is. And for how healthy it is I actually think it is a pretty awesome exchange. Definitely one of our highlights of doing the whole 30!! I have never noticed an odor in the freezer but do smell it once it is dethawed and I start to cook it. Maybe freezing it prevents the stench? I bought a large bag of cauliflower rice from Costco and it did not last the week. And, yes, it did smell. At first, I didn’t know if it was the cauliflower or the Brie cheese. LOL. I have tried frozen from the store, but am looking forward to trying this with the next batch I get! Thanks! How long stay freeze until not good? Standard vegetable freezing guidelines say that you can freeze cauliflower for 6-12 months. We have never left it in our freezer that long though. Hope this helps! Doesn’t it need to be blanched at all? I have frozen cauliflower for years but always blanched it. I have never blanched mine and it is always worked well with how I cook it. When you freeze veggies it usually changes their cellular structure a bit since the water expands when it freezes, but that is similar to what happens when it is cooked, so if you plan on cooking it then I think it shouldn’t matter! I do always cook mine on pretty high heat to avoid it being mushy or watery. What a great post. I’ve always just bought the trader joe’s one but this looks really easy. Thank you! Thank you so much Tabitha! We moved last year and don’t have a Trader Joes close anymore but glad to know they have it if we get back close to one! So glad this was helpful! Thank you so much for posting this! I love cauliflower rice but find it time consuming. I have wondered if I could freeze it, glad to hear someone else had success!! Thanks for taking the time to post about how to freeze. Thankfully I had done precisely what you did (only on a box grater- sadly no food processor) and o froze the “rice” uncooked so I could later fry quicker on weeknights. Glad to know it was the safe method to have done!! I also buy heads of caluliflower while its on sale and stock up–great item to sub in may casserole dishes. Going to have to try this…we have a Trader Joes in the town my husband works in which I sent him to and they indicated if you were not in the store when they opened your out of luck…so doing this on my own! This method MAY work if you use the cauliflower in a week or so. I’m concerned that you deem it safe with a shelf-life of 6 months, That is totally incorrect. That shelf life is for BLANCHED cauliflower. Most vegetables require blanching to kill the enzymes that will spoil the food. I’ve been seeking a way to safely freeze cauliflower rice and not get food poisoning. This method should only be used if the cauliflower will be used within a week or so. Otherwise, people will play roulette with food poisoning. I’m confused…freezing unblanched vegetable is not safe? I’ve never heard of that. Sorry but this information is incorrect. Blanching is not done for food safety – it’s done to preserve color, taste, and nutrients. Also, enzymes have nothing to do with food safety. Enzymes can cause loss of nutrients and loss of flavor, so deactivating them makes your food more nutritious and better tasting (and brighter/better looking) for longer periods of time. Yes, blanching kills microorganisms on the surface of vegetables, but freezing also slows/halts the growth of most microbes. (When you thaw unblanched food, however, the surviving microbes can resume growth.) When there are time limits placed on frozen food storage, it has to do with quality/taste… not food safety. Properly frozen food can be stored, safely, indefinitely… it just might not taste great. Unblanched vegetables can be frozen safely, but again, they might not look or taste as good. I appreciate this clarification very much! I thought there had to be something misunderstood about the blanching since freezing food is a very safe method. I blanch the cauliflower florets before ricing, I’ve never ever heard that veggies are good for six months without blanching!After blanching into the food processor and then I rice it all and freeze. THEN, yes it’s all good for a long time! I checked online and found out that I can soak cauliflower in salt and water instead of blanching. Tried this and it works like a charm. Now Costco sells double bags of the cauliflower rice. I always pick up a few when I can’t slow down enough to process my own. I use one bag to make our pizza crust (my son and husband say it’s THE BEST), one bag for our mashed potatoes (a BIG hit at our family gatherings. They always ask me to make it), fried rice, etc. I also make a big batch of my own super healthy spaghetti and turn it into 3 to 4 different meals. 1st Spaghetti, of course. Over Zucchini noodles. 2nd: stuff red or green pepper with some of the ‘spaghetti’ mixture (you can add different spices at this time to change the flavor), for stuffed peppers, adding cheese on top after pepper and mixture is heated. 3rd, mini Shepherd pies. I take some of the ‘spaghetti’ and add like peas, carrots, what you like, heat all that up in a skillet, then put into ramekin dishes and top with my cauliflower mashed potatoes and bake in the oven till potatoes are brown. 4th. I make my zucchini lasagna. I take like 1/2 lb to 1 lbs of the spaghetti and add 1 lb of spice or mild italian sausage that I pre cooked. Make my cheese layer mixture. Now do the layers! I love being creative and trying to cook large amounts ahead of time to make several meals during the busy week. What great ideas! Thanks so much for sharing! I’m going to have to see if our costco carries it too! Trying this recipe this coming week! Hi Teri- I usually cook my frozen rice in a skillet on high heat with just a tiny bit of olive oil. The high heat steams out the moisture so it still has a really good texture. When you freeze vegetables it changes their cellular structure since the water inside the vegetables expands when frozen. I am not sure you will ever get the same result as you do with using fresh cauliflower if you are steaming but if you defrost the rice then wrap it in a tea towel and squeeze out as much liquid as you can it would probably help. You can do this before freezing, after freezing or both! I hope that helps! I have a question, I wanted to try this cauliflower rice first before I made my own. and it was great. now I shredded my own and froze it. now the first bag that I bought had me microwave it and then use it in my recipe, and it came out great. why can’t I do that with the cauliflower that I freeze instead of putting it in the frig, or on the counter to defrost, do you think it will be the same? How many cups of rices cauliflower would you say you get from an average sized head or cauliflower? I get about 4 cups per head. Thank you for this information. Only last night, I decided to buy and prep this myself as opposed to spending the money on the prepackaged options. Thanks for sharing. I love to make cauliflower sweet potato fried rice. Oil or butter, soy sauce, onion powder garlic powder and brown sugar. It is top notch. Ive never made rice flower but would like to try it. Has anyone had success with using a ninja blender instead of a food processor? I have a friend that does it in her blender by adding cauli and water then straining it in the end. Hope that helps! This was a great idea! In case anyone is wondering, I have a large family so I froze them in gallon bags. I riced my cauliflower in the food processor and put 2 – 32oz bags of florets riced into each 1 gallon bag. Thanks! This recipe will definitely come in handy. I am going to save so much money by preparing these quart-sized bags at home.